Yep, the "economy" galvanized roofing - comes in 8' lengths, so each piece makes 4 24" panels. I didn't have time to scrounge materials because I wanted to build these while my dad was here to help me, but it would probably be pretty easy to find some roofing from an old shed or something for free. The blade to cut it with a circular saw was only like $4. I'm on to the next project -- more deconstruction right now than construction. 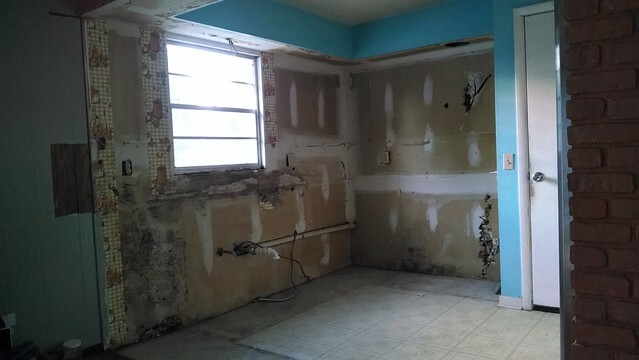 I just gutted our old house's kitchen yesterday, preparing for a total kitchen re-do. I'm looking for used cabinets, I've been eyeing the 'builder grade' new stuff at Home Depot-- not sure what I'm going to do yet. Anyway, here's a 'before' pic. Somebody, somewhere (in the 70s?) 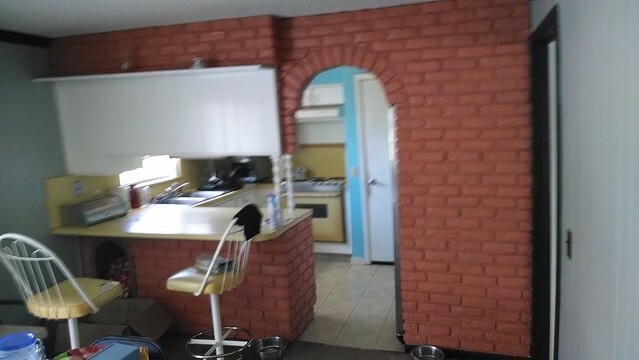 thought this fake brick was a good idea. And here's what it looked like after a hard day's work yesterday. I pulled the upper cabinets down by myself, thinking I'd either possibly re-use them or donate them. I probably shouldn't have bothered. Yes, the drywall is coming down also, as well as the remnants of the fake brick wall. Old roofers trick is to use an old circular saw blade turned around. Ruins the blade for anything else (so only sacrifice an old one). Make sure to wear hearing and eye protection it gets really loud.